handmade SPRING PROJECTS TO TRY TODAY! Welcome to the world’s first home and hobby cutting machine with a built-in scanner. aster is one of our favourite times of year here in the Craftseller oﬃce. Obviously eating copious amounts of chocolate has something to do with it, but we adore the cute makes, ﬂoral fabrics and pretty pastel shades that emerge out of the crafting world this time of year. Spring is in the air and it feels like we've ﬁnally turned the corner on a sad and soggy winter. So what better way to celebrate Easter and our springtime optimism than with an issue packed full of bright and beautiful handmade crafts, including paper Easter cones for chocolate egg hunts (p27), delicious hot cross muﬃns (p46) and a really pretty oilcloth picnic set (p94). Elsewhere, we have a set of adorable needle felted bugs (p84) and of course, we have our cute cover stars over on page 16 – the little crochet chicks! Great sellers both online and at fairs. Feature-wise, check out our top ten tips for best-selling Easter makes on page 38 and over on page 81, we walk you through how to choose the right craft fair for your style of crafting. And ﬁnally, this month we’re giving you a FREE easy-to-make, felt bunny bag kit! The perfect pouch for little treasure hunters to carry as they stash their Easter treats. Enjoy! Happy Easter all! Got the needle felt bug yet? You will with this sweet set! A gorgeous, ﬂoral oilcloth picnic set – what's not to love? BE AN INSIDER We want to know what you think. After all, the more we know about you the better placed we are to bring you the best magazine possible. So we would like to invite you to join our online reader panel ‘Insiders’. Interested? Log on to www.immediateinsiders.com/ register to ﬁll out the short registration survey and we’ll be in touch from time-to-time to ask for your opinions on the magazine and other relevant issues. We look forward to hearing from you soon. 10 best-selling makes for Easter Discover what tops other crafters’ best-selling lists for this special day Charity bakes Bring out your inner baker and raise cash for three great causes Fab freebies Enter now and you could get your hands on some brilliant prizes Diary of a craft-selling mum New designs, tears and teething and one very special birthday... Get to market! Should you make craft fairs a part of your craft-selling plan this year? Annie Bellamy Papercraft expert, Annie, has created the cute Easter egg hunt cones on page 27 Annie is a talented designer with a passion for crafting, reading (and writing) blogs, taking photographs and scouring local charity shops for treasure! She regularly contributes her pretty papercraft projects to UK craft magazines, as well as working in the art department of a local school. A SPECIAL MENTION TO Editor Zeena Moolla Editorial Assistant Beth Collins Art Editor Kit Cheung Publisher Alison Worthington Publishing Director Cath Potter Managing Director Andy Marshall Advertisement Director Caroline Herbert Senior Advertising Manager Jane Hendy Advertising Designer Catherine Howlett Production Director Sarah Powell Production Managers Rose Griffiths and Louisa Molter Marketing Director Jacky Perales-Morris Direct Marketing Manager Penny Clapp Marketing Executive Lucy Osmond Reprographics Tony Hunt, Chris Sutch Photography Louise Broom, Ally Stuart, Steve Sayers Distribution Frontline Printed in the UK by William Gibbons A special thank you to contributors and designers Annie Bellamy, Emma Read, Vicky Craxton, Liz Ward, Jess Sharp, Sarah Heys, Wendy Massey, Jane Tooze, Claire Watkins, Dorothy Wood, Karen Dunn, Angela Turner, Sarah Chadwick, Charlie Lyon, Steve Wright, Marie Parry, Verity Gough, Holly Johnson, Jo Benner, Helen Burge, Katriel Costello Subscriptions and customer enquiries To place a subscription or order any of our wonderful sewing, knitting or craft magazines, please call the subscriptions hotline on 0844 844 0388. It’s open weekdays 8am-8pm and Saturday 9am-1pm. Join us on Facebook or follow us on Twitter Become a fan of Craftseller on Facebook or follow @craftsellermag on Twitter and you can take part in competitions, share news, tips and more. Copyright guidelines for projects We have requested specific permission from authors, book publishers and designers so that you can recreate and sell the projects from this issue. Please credit the designer where appropriate and when it has been requested. Craftseller is for crafting enthusiasts who want to make beautiful, handmade items to sell. You can individually make as many as you wish to sell either for yourself, your local event, summer fete or to raise money for charity. You cannot go into mass production, which means you cannot manufacture in large quantities, especially by machine. Please respect one another’s copyright. Emma started her business Hapitat when she couldn’t ﬁnd a fascinator to wear to Ascot. Emma’s specialty is stitching pretty silk ﬂowers but she is our go-to designer for all the projects that use silks, chiﬀons and other delicate fabrics. You can buy her gorgeous makes on hapitat.co.uk or etsy.com. Immediate Media Company Limited is working to ensure that all of its paper is sourced from well-managed forests. Vicky Craxton This magazine can be recycled, for use in newspapers and packaging. Please remove any gifts, samples or wrapping and dispose of it at your local collection point. Needle felt Vicky’s little bugs (p84) or give her picnic basket set (p94) a try Versatile crafter Vicky loves using bold prints and creating quirky designs. She adores vintage clothing and accessories too. This issue she oﬀers not one but two great projects with lots of selling potential. To see more of her work pop over to her shop at vickysvintagegifts.co.uk. Immediate Media Company Limited, 9th Floor, Tower House, Fairfax Street, Bristol BS1 3BN. Tel: 0117 927 9009 Fax: 0117 934 9008 Immediate Media Company Limited is dedicated to producing the very best consumer specialist interest magazines, edited and designed to inform our readers, enhance their lives and give them the best value for money possible. Please visit www.immediatemedia.co.uk for details of our other publications. We take great care to ensure all elements of Craftseller are accurate. However, we accept no liability for any misprints or mistakes that appear in this magazine. All prices quoted are correct at the time of going to print. ©Immediate Media Company Limited. ”Geometrics remain popular: big, bold patterns, blocks of strong colours (citrus yellows, oranges and greens alongside metallics) will be combined with paper folding techniques to create statement, abstract pieces.” Clare’s new book Letter Art (published by CICO Books, £14.99) is available from all good bookshops or visit cicobooks.co.uk. For more fab craft ideas visit Clare’s blog at clareyoungs.co.uk. doozey.co.uk Fab new online handmade marketplace promising to showcase the most unique talent. ideastap.com A charity for creatives with a supportive online community offering all manner of tips and advice for members. Move over woodland creatures – this is the year of the horse! Expect to see our four-legged friends making a guest appearance on everything from wallpaper and cushions to jumpers, jewellery and more. If you like the idea of incorporating the trend in your own makes, why not oﬀer a personalised service, giving shoppers the option to add names or messages to your horsey designs? handmadecharlotte.com Design-loving vintage fan Charlotte shares her favourite recipes, crafts, décor and more. pring is in the air and what better time to think about adding a new range to your craft oﬀering? According to new research, there’s a baby shower boom here in the UK, with us ladies now spending £220 million a year on gifts and decorations for the occasion. Whether you sew, bake or knit, it could well be worth cashing in on the trend! EASTER PASTELS WITH SWEET, SORBET SHADES popping up all over the place, Easter has never looked so pretty. Pale blues, mint greens and vintage violets are particularly popular this spring, with a dash of sunny yellow thrown in (we need it after the wet winter we’ve had!) For more on this year’s colour trends, visit pantone.com. If you love bright, bold design, take a look at graduate Katie Whitton’s winning creations (katiewhitton.com). Inspired by travel and architecture, Katie uses a blend of screen printing and digital printing techniques to produce her unique, contemporary textiles. As winner of the New Designers Tigerprint award in 2013, she’s a name to watch in the world of designer makers. Success story WHILE HAVING A QUICK gander at the magazines in the supermarket I saw Craftseller. I only started my business three months ago so I’m really interested to read fellow crafters’ success stories. It’s an absolute mineﬁeld, learning about marketing, branding, blogs and actually ﬁnding the time to make products. I look forward to the next issue. I’ll count it as research and enjoy the mag guilt-free! Taste of the Orient THANK YOU FOR THE beautiful Oriental Garden craft papers that came as the free gift with the February issue of Craftseller. I haven’t had the courage to sell any of my handmade cards online yet but I am seriously thinking about it. I’m really enjoying the current trend for oriental-themed crafts that seems to be everywhere at the moment. I was so inspired by the papers that came with issue 33 of the mag, that I made this cherry blossom card. I’m going to give it to one of my best friends on her birthday – I really hope she likes it! CATHERINE BOORMAN, ST LEONARDS ON SEA. Ed: Catherine, we think your friend is going to love her birthday card! It looks fantastic and deﬁnitely something that you could sell if you decided to. We really like the way that you have layered the ﬂower petals and added the beads as a ﬁnishing touch. I ﬁrst came across this lovely lass when I was given her book; Queen of Crafts for my birthday. When I found her blog I was so excited! Limitless inspiration and fun from one of my favourite new generation crafters – I can’t recommend taking a look enough! Starting out I AM JUST TRYING TO start up my own little business and as I write this I’m about to subscribe to your magazine because it’s ﬁlled with inspiration and useful information. I’ve set up a blog page on FB and now that I feel like I’m ﬁnally over the Christmas mayhem (am I the only one?) I shall be seeing what steps I can take next. Take a look at my progress at Bonnie Things. BEVERLEY ROGERSON, BONNIE THINGS Ed: Well, we’re sure you will ﬁnd everything that you need to succeed within the pages of Craftseller. Good Luck! Who wouldn’t want to play in one of Clare’s funky tents? Space to play MY NEW PLAY SPACE business has been open for a couple of months and I’m starting to get a following on Facebook! My two little ones were the inspiration for Twinkle Teepees And Play Tents. I wanted to start a business that used my creativity and encouraged children to learn through play. They have been CE toy safety certiﬁed and sold with all the accessories. Next challenge? Design table dens so my kids can have more fun under the dining table! CLARE GOODENOUGH, TWINKLE TEEPEES AND PLAY TENTS Ed: We would have loved your tents when we were kids! What a great idea, Clare. Good luck! 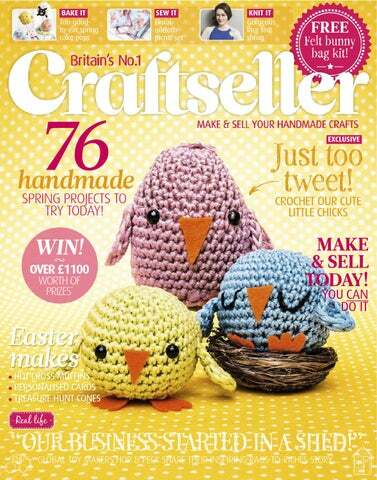 @CraftsellerMag is the best as the designs are copyright free! @CraftsellerMag the calender I got FREE with the mag looks great in my new #craft room. I’m hooked! I have always been interested in crafts but since my Grandma gave me a subscription to Craftseller I’m hooked! I’m 15 and haven’t been crafting for very long but when I saw the map lampshade it inspired me to make this quote picture frame from old book pages. Thank you for creating such an amazing mag! FRANCES CHANNER, ESSEX Ed: Welcome to the exciting world of craft, Frances. We hope you enjoy the rest of your subscription! @CraftsellerMag I made your drawstring bag for my niece! ith Easter being all about chicks, bunnies and chocolates, this family of sweet chubby chicks is right at home! The simple amigurumi patterns includes three different size chicks, plus a cute cracked egg, and can be customised to make any combination you wish to sell. The outlay for raw materials here is very small, and these ‘penny makes’ can really help boost your proﬁts, especially as they take very little time to whip up and their dinky size means you can get lots done in one sitting. Once they’re in your repertoire you’ll ﬁnd all kinds of ways to use them, and being so cute, we think they’ll be an all-year-round favourite with buyers. Make one using yellow yarn. Make a magic ring and work 6dc into the ring. 6sts. Round 1: Round 2: (dc in the ﬁrst st, 2dc in the next st) repeat to end. 18sts. Round 3: (dc in the ﬁrst two sts, 2dc in the next st) repeat to end. 24sts. Round 4: (dc in the ﬁrst three sts, 2dc in the next st) repeat to end. 30sts. Round 5-7: (dc in each st to the end. 30sts *mark Round 5 with a stitch marker* Round 8: (dc2tog, dc in next three sts) repeat to end. 24sts. Insert the eyes now - they go on the marked round, 6sts apart. Round 9: (dc2tog, dc in next two sts) repeat to end. 18sts. Round 10: (dc2tog, dc in next st) repeat to end. 12sts. Stuff the toy ﬁrmly now. Round 11: (dc2tog) repeat to end. 6sts. Cut yarn leaving a long tail and pull through loop to secure. Sew the opening at the bottom closed. Weave in and cut off any loose ends. Egg shell bottom Make one using cream yarn. Make a magic ring and work 6dc into the ring. 6 sts Round 1: 2dc into each st to the end. 12sts. Round 2: (dc in the ﬁrst st, 2dc in the next st) repeat to end. 18sts. Round 3: (dc in the ﬁrst two sts, 2dc in the next st) repeat to end. 24sts. Round 4: (dc in the ﬁrst three sts, 2dc in the next st) repeat to end. 30sts. Round 5-6: dc in each st to the end. 30sts. Round 7: (dc in the ﬁrst st, sl st in the next) repeat to end. 30sts. Cut yarn leaving a long tail and pull through loop to secure Sew the top and bottom of the egg around the baby chick. Weave in and cut off any loose ends. Medium chick Make one in green and one in blue. Make a magic ring and work 6dc into the ring. 6sts. Round 1: 2dc into each st to the end. 12sts. Round 2: (dc in the ﬁrst st, 2dc in the next st) repeat to end. 18sts. Round 3: (dc in the ﬁrst two sts, 2dc in the next st) repeat to end. 24sts. Round 4: (dc in the ﬁrst three sts, 2dc in the next st) repeat to end. 30sts. Round 5: (dc in the ﬁrst four sts, 2dc in the next st) repeat to end. 36sts. Round 6-10: dc in each st to the end. 36sts *mark Round 7 with a stitch marker* Round 11: (dc2tog, dc in next four sts) repeat to end. 30sts. Round 12: (dc2tog, dc in next three sts) repeat to end. 24sts. Insert the eyes now, they go on the marked round, 7sts apart (green chick only). Round 13: (dc2tog, dc in next two sts) repeat to end. 18sts. Round 14: (dc2tog, dc in next st) repeat to end. 12sts. Stuff the toy ﬁrmly now. Round 15: (dc2tog) repeat to end. 6sts Cut yarn leaving a long tail and pull through loop to secure. Sew the opening at the bottom closed. Weave in and cut off any loose ends. the last st. 9sts. Cut the yarn leaving a long tail and pull through loop to secure. Sew onto the body one either side, weave in any loose ends and cut yarn. Eyes and feet Use black embroidery thread to sew little U-shapes onto the blue chick to make sleepy eyes. Cut three triangles out of orange felt. Use the photo as a guide and cut notches out of two to form the feet, then glue in place with fabric glue. Large chicks Make one in white, one in lilac and one in pink. Make a magic ring and work 6dc into the ring. 6sts. Round 1: 2dc into each st to the end. 12sts. Round 2: (dc in the ﬁrst st, 2dc in the next st) repeat to end. 18sts. Round 3: dc in each st to the end. 18sts. Round 4: (dc in the ﬁrst two sts, 2dc in the next st) repeat to end. 24sts. Round 5: dc in each st to the end. 24sts. Round 6: (dc in the ﬁrst three sts, 2dc in the next st) repeat to end. 30sts. Round 7: dc in each st to the end. 30sts. Round 8: (dc in the ﬁrst four sts, 2dc in the next st) repeat to end. *mark this round with a stitch marker*. 36sts. Round 9-14: dc in each st to the end. 36sts. Round 15: (dc2tog, dc in next four sts) repeat to end. 30sts. Round 16: (dc2tog, dc in next three sts) repeat to end. 24sts. Insert the eyes now, they go on the marked round, 7sts apart. Round 17: (dc2tog, dc in next two sts) repeat to end. 18sts. Round 18: (dc2tog, dc in next st) repeat to end. 12sts. Stuff the toy ﬁrmly now. Round 19: (dc2tog) repeat to end. 6sts. Cut yarn leaving a long tail and pull through loop to secure. Sew the opening at the bottom closed. Weave in and cut off any loose ends. Wings Make as for medium chick in matching body colour. Feet Cut three triangles out of orange felt. Use the photo as a guide and cut notches out of two to form the feet, then glue in place with fabric glue. Hair Purple chick Make a magic ring and work 6dc into the ring. 6 sts Round 1: (ch 8 sl st in 2nd ch from hook, sl st in next 5sts, dc) twice into each st to the end. Cut yarn leaving a long tail and pull through loop to secure. Sew onto head. Weave in and cut off any loose ends. White chick Use a long strand for the matching yarn and sew into the top of the chick’s head. Do not pull the thread all the way through so each stitch makes a little loop. Weave in end to secure loops and cut off. Pink chick Use a long strand of the matching yarn. Thread through the stitches at the top of the head. Knot together and cut off. Repeat a few times to get a spiky hair effect. SAFETY FIRST These chicks are not designed as toys, or for young children. Always ensure your work is well-stitched and loose parts are securely attached. Remember, if you intend to sell them, even if they're not sold as a toy, there are strict regulations to adhere to. Visit craft-seller. com/free-downloads for more advice. Diversify! Such a simple design can be reworked to create any number of new products from juggling balls and mini keyrings to paper weights and door stops. Create a springtime mood board on your website using the chicks alongside other spring makes and upload to Instagram, Facebook and Pinterest. Offer pick 'n mix colour combos. Monotones, neon brights or pretty pastels are always popular so why not let buyers choose their own tones? Be creative with product photos. Head to a farm or wood or simply nestle the chicks in long grass in your garden. The key is to have fun! Keep them current: list online under 'table decorations', 'spring gifts' and 'Easter', but also tag with 'farm fun', 'animal makes', and 'crochet birds'. Be scrap happy! Save money by using up oddments of felt for beaks and feet and tiny buttons for eyes. Make mini nests. Shred kraft paper, form into a ball and ﬂatten to create sweet packaging buyers will love. Create quirky hen houses. Simply print plain gift boxes with wood effect paper and cut out holes for windows. Appeal to families: Print buyers' children's names onto 'birth certiﬁcates' and pop into packaging. Make cute egg cosies: leave the bottoms of the chicks open, omit the feet and ﬁnish off neatly. Great value compact sewing and embroidery machine. Features a wide range of advanced sewing and embroidery functions while being lightweight and portable. Computerised sewing machine featuring 294 built-in stitches including 3 lettering styles and 10 one step button hole styles. Ideal companion for the avid sewer and quilter. Computerised sewing machine packed with user friendly features such as easy jog dial stitch selection and one touch needle threading. Includes 70 built-in stitches with 7 automatic button hole styles. All offers valid from 1st February- 31st March 2014. Subject to availability. and became a stay-at-home dad with his daughter, Hattie. We met up for the ﬁrst time at our local playgroup in Saﬀron Walden in April 2010 and immediately clicked. We both loved design and decided we wanted to make things together. We’d meet up at Steve’s shed, drink tea, come up with ideas for wooden toys, and the kids would play together and try out the toys. Hop & Peck’s Top Three Craft Tips Display is key Our best-selling item is the Bunny Ear Egg Cup, but if you saw it out of context you might not know what it was. Displaying it properly so people can see how it works has been the key. If your customer gets a nudge by showing what they can do with your product, they’re far more likely to buy. This can be a simple as adding a couple of props alongside it or even photographing it with a relevant backdrop. Go for awards We didn’t set out to win awards, but they are brilliant for getting your name out there and, in turn, boosting your sales. There are lots of national competitions springing up as well as online awards so we’d suggest entering as many as you can, although beware of paying an entrance fee unless it’s for an award that can raise your proﬁle otherwise the outlay may not be worth it. Keep an eye on the detail We keep things simple with our designs and make sure that our packaging sells the product inside. There’s no need to spend a fortune either; for example using a perfect box but tying it with a strip of pretty ribbon can really make your product stand out and show people that they are buying quality. “Our business still has a real family feel to it and we would never, ever want to lose that” more staﬀ in so Steve has some help in the workshop and we’ve already roped in my mum up in Leeds to work for us and she does all the packaging and posting. Steve’s son Jasper even helps out too. The lovely thing is while our business has grown, it still has a real family feel to it and we would never, ever want to lose that. It can be a juggling act and our partners are very understanding, but we wouldn’t have it any other way. Steve and I couldn’t have done this without each other. I’m so proud of what we’ve achieved and of the fact that our kids are still central to the business, especially as that’s how we met in the ﬁrst place. EACH ADULT & SENIOR TICKET IF ORDERED AT LEAST ONE WEEK BEFORE THE SHOW. FREE Patterns & everything you need for your micro-macrame obsession! scan me! Textile, jewellery & paper craft supplies plus some lovely gifts - arenâ&#x20AC;&#x2122;t we fancy! retty paper ﬂowers are surprisingly realistic and inexpensive to buy from artiﬁcial ﬂower suppliers. To recreate the vintage style used here, look for ﬂowers that are a very light coffee colour or cream, rather than pure white or ivory. Choose more than one style of ﬂower in slightly different shades to create interest and add dimension to the design. These high quality Swarovski Elements crystal pearls in powder almond were chosen to tone in with the coffeecoloured ﬂowers but feel free to choose a different shade from the wide range of colours available. To be really smart and tap into the wedding set, offer to make unique hair combs for bridesmaids in colours that match the dresses. How to make the roses hair comb Separate out the bundle of paper roses carefully into individual stems and lay out six leaves. Hold the ﬁrst rose on the front of the hair comb and tuck the stem between the second and third prongs. Wrap the wire stem around the hair comb bar once and leave sticking out at the top. Repeat to add ﬁve more roses spaced regularly along the hair comb. Add the other two roses towards the middle of the hair comb to add depth in the middle. Tuck the smaller ﬂowers between the roses one at a time to create a pleasing arrangement. Wrap the wire stems around the hair comb bar as before. When you are satisﬁed with the shape, trim the wire tails close to the comb. Tuck six leaves, one at a time, behind the roses and secure by wrapping around the hair comb bar. Take care not to damage the ﬂowers as you wrap. Pick up an 8mm pearl on to a 20cm (8in) length of craft wire and twist once or twice to secure the wire behind the bead. Tuck the ends of the wire between the roses so that the wires go on opposite sides of a prong or the bar. Twist the wires together to secure. Use one of the tails to attach the next pearl. You can wrap the wire so that the pearl is close to the hair comb and sits snugly between the ﬂowers or create a twisted wire stem to raise it up and add some dimension. Add all the pearls then trim the tail. Tuck all wires and ends away discretely on the right side of the comb, between the embellishments. P R O F IT ! he seventies are the next decade to be back in vogue as ﬂared trousers and stomach-skimming tees appear across the catwalks so those with an eye for trends will love this natural look, vintage-inspired crochet string shopping bag. It's bound to be a great hit with shoppers at your next craft fair or event. Not only does everyone need something to carry all those crafty purchases in but this crochet bag is even better as it can scrunch up small and ﬁt into an everyday handbag. Made with a cotton blend yarn, it is strong but will wash easily and last a long time. We’ve kept this in a neutral palette to go with the soft retro colours that are popular this season, but you could easily customise it with different decorations such as beading and pretty ribbons or whip up a few in various shades to suit any style. And as only basic crochet skills are needed to make this bag, it's a really addictive project to make over an evening. If you’ve never dared venture further into crochet than granny squares this will be the perfect project to try next. sts in each ch space, sl st into 1st tr to join. 92sts. Cut yarn leaving a long tail and pull through loop to secure. Weave in and cut off any loose ends. Straps (make 2) Ch7. Row 1: tr in 3rd ch from hook, tr in the next 4 ch sts. Row 2: turn, ch2, tr in each st to the end. 6sts. Repeat row 2 until the strap measures 60cm (24in) Cut yarn leaving a long tail and pull through loop to secure. Use the photo as a guide to sew in place on the main body of the bag. Weave in and cut off any loose ends. To finish Sew buttons onto the bottom of the straps using the matching yarn. Thread ribbon or cord through the top of the bag and tie in a bow. his is vintage cross stitch piece is given a modern touch with bold colours and funky lettering. Made by stitching ﬂoral letters onto aida fabric, this versatile design can be stitched on a variety of fabrics depending on your experience. If you are looking for a quicker project, stitch on aida as we have, or if you want more of a challenge, pick a pastel evenweave which would look lovely with the design. You could also charge a bit extra to reﬂect the extra time and skill involved. Why not mix-up the framing with alternatives to this formal one by making the piece into a door hanging or pop into a hoop for a quicker ‘framed’ ﬁnish. Another idea to make this your own is to use different fabrics for a unique ﬁnish – just use soluble aida and stitch onto some pretty ﬂoral fabric to make your design stand out. half stitches before returning and completing each of them with the other half stitch. Check over your work at the end, and trim and tidy up the loose ends at the back. Press gently on the back of the work, using a clean cloth to protect the threads. Carefully line up your stitch with frame, trim the aida and insert into frame. Find the centre of the fabric by folding it in half horizontally and vertically. Find the centre of the chart by following the gridlines and start stitching from this point. Children are often at the centre of Easter celebrations and, increasingly, shoppers are looking for a way to indulge them with something other than chocolate as Kirsty Hartley of Wild Things Funky Little Dresses (found on Etsy, Folksy and Not On The High Street) has discovered. Her bunny and chick dresses sell especially well at Easter with half her orders coming from US customers: “My makes are bought by grandparents, parents, aunties and uncles, and their irresistible cute factor makes them perfect Easter gifts for the big Easter egg hunt,” she says. Easter biscuits are bigger than your average biscuit – hurrah! We love them for this, and for their soft, sugary crunch and tasty, chewy currents. Hyan-Young Shin, who runs her own boutique biscuit bakery based in West London, biscuitvillage.com, is seeing sales of her iced Easter biscuits rise year on year. “Our Spring Easter Tin is a best seller, second only to the Christmas tins. And while our customers favour bold vibrant colours at Christmas, we opt fpr pretty pastel tones for our Easter designs,” she notes. Craftseller is the ONLY magazine for crafters who want to make and sell with every issue packed with 100s of ideas to make for your stall, sell online or give as gifts. Featuring gorgeous, on-trend projects for easy proďŹ t, monthly expert advice and real life success stories, Craftseller is the perfect companion to inform and inspire you to join the craft-selling community. hese scrummy Easter treats look and taste fantastic, and they’re a great way to tempt shoppers over to your table. Most people will buy a treat to eat at any event, so don’t be shy and stack them high. This month’s delights include gorgeous swirly chocolate fudge cupcakes for the chocoholics – pile them up on a pretty tiered cake stand for maximum impact! You also can’t go wrong with the cute Easter-themed cake pops – sell wrapped in scrunchy cello bags for an Easter gift or for lucky kids to rip open and eat there and then. Finally, a much-loved spiced hot cross bun, is given a modern twist as a moreish mufﬁn, great for the traditionalists in the crowd and lovely to take home for a special Easter breakfast. Easter cake pops If you wish to use homemade cake for the cake pops, beat together 200g (7oz) each of sugar, butter and self-raising ﬂour along with four eggs and a teaspoon of vanilla extract. Add some food colouring (optional, but pink looks good). Divide the mixture between two lined 20cm (8in) sandwich tins and bake in an oven preheated to 180°C, 160°C Fan, Gas mark 4 for 25-30 mins. Cool completely before proceeding as follows. Using your hands or a food processor, break the cake into ﬁne crumbs. Melt the white chocolate and mix all but two tablespoons of it into the crumbs. Use your hands to clump together walnut-sized amounts of the mixture and roll into balls or egg shapes – each should weigh about 25g (1oz). One by one, dip the tips of the cake pop sticks into the remaining melted chocolate and gently insert no more than half way into the balls. Place the cake pops on a baking sheet, cover loosely with cling ﬁlm. For the chicks you will need to cut the orange chocolate buttons in half to make feet, and in quarters to make the wings and beaks. For the sheep, shake the pearl sprinkles into a bowl. Cut some of the licorice buttons into pieces to make the legs and ears of the sheep; keep some whole for the faces. Also have ready some tall glasses or oasis to stand the pops in while they dry. any excess. You can ﬁll in any gaps around the base of the cake pop by spooning some chocolate over. Dip and decorate the cake pops one at a time, placing them in a glass or oasis to dry when ﬁnished. For the Easter eggs, stick sprinkles of your choice all over the surface of the egg-shaped cake pops. For the chicks, stick on the feet, wings and beaks (once the chocolate is dry you can draw on the eyes using the black edible food pen). For the sheep, ﬁrst stick a licorice button on for the face, then roll the cake pop in the pearl sprinkles. Use a little of the chocolate to stick on the licorice ears and legs. Make the nose by sticking a heart-shaped sprinkle onto the face of the sheep; paint on the eyes using a little of the melted chocolate. The ﬁnished cake pops will last for up to a week in a cool place (not the fridge). How to make the hot cross bun mufﬁns Put the ﬂour, salt and spices into the bowl of a freestanding mixer ﬁtted with the dough hook attachment. Mix brieﬂy to combine. To different sides of the bowl, add the yeast, sugar and salt. Heat the milk until lukewarm and add this to the bowl, along with the eggs and butter. Mix the ingredients on a slow speed for a couple of minutes until combined. Increase the speed to medium and mix for a further ﬁve to ten minutes. Alternatively you can knead the dough by hand but it will take longer. Tip the dough into a lightly oiled bowl; cover loosely with cling ﬁlm and leave aside for about an hour, until the dough has doubled in size. Hot cross bun mufﬁns Once the dough has rested, incorporate the dried fruits and lemon zest and leave to rise for a further hour, as before. Meanwhile, cut out 12 squares of baking parchment, each measuring about 12cm x 14cm (5 x 5 ½in). Once the dough has had its resting time, divide it into 12 even-sized pieces using lightly oiled hands. Press a square of baking parchment into a tin hole and drop a ball of dough into it; repeat with the remaining baking parchment and dough. Preheat the oven to 200°C, 180°C Fan, Gas mark 6 and leave the buns to rise for 30 mins. For the crosses, mix the ﬂour with 4-5 tbsps cold water until a smooth paste is formed. Spoon this into a piping bag ﬁtted with a plain round tip (or just use a freezer bag with the corner cut off). Pipe crosses of the ﬂour paste onto the buns, then bake them for 15-20 minutes until they are well risen and browned. Brush the buns with the melted golden syrup and remove to a wire rack to cool. The buns are best eaten on the day of making. TOP TIP It’s a good idea to wrap each mufﬁn individually as they can get very sticky! To make the chocolate fudge icing, ﬁrst melt the butter in a saucepan or microwave. Measure the cocoa into a large bowl; add the butter and stir or whisk to make a paste. Stir in the milk then gradually add the icing sugar to make a thick, glossy icing. If the icing is too thick, add a little. more milk. Spoon the icing into a piping bag ﬁtted with a large star-shaped tip and pipe swirls of icing onto the cupcakes. Top each with three chocolate eggs. The ﬁnished cupcakes will keep in a sealed container for up to ﬁve days. SELL MORE Package in boxes of four, six or even 12 and sell as family or party-size treats! Pre-heat the oven to 170°C, 150°C Fan, Gas mark 3. Sift the cocoa into a large heatproof bowl or the bowl of a freestanding mixer. Stir in 4-5 tbsps of hot (but not boiling) water to create a thick paste. Line a 12-hole mufﬁn tin with paper cases. Once the cocoa mix has cooled a little, add all the remaining cake ingredients and beat together for one 1-2 mins using a freestanding mixer or electric whisk. Divide the cake batter between the cases and bake for approximately 25 mins, until the cakes have risen and are ﬁrm to the touch. Remove the cakes from the oven and cool in the tin for a few minutes before moving to a wire rack to cool completely. “Help deaf children to have all the same opportunities” young people to learn new skills, gain confidence and meet other deaf children – often for the first time. So put your cake-decorating skills to use, then invite friends, family and neighbours to make donations. Every penny will help give deaf children to have all the same opportunities as any other child. You can find recipes and fundraising tips to get started at ndcs.org.uk/ bigcakebake. including TV’s Sian Lloyd when you register your event – you’ll receive a free party pack containing invites, balloons, a guest donation form and recipes from Britain’s own master chocolatier, Paul A Young. cope with cancer by funding world-class research, and with national charities and the government reducing their investments in cancer research in Yorkshire, the charity needs your help now more than ever. So what can you do? We think this is a great initiative for your craft club to get involved with. Simply invite all the members to get together. You just need a venue, some tea and a couple home-baked cakes. Make even it more fun by having a theme – Yorkshire Cancer Research held its own Mad Hatter’s Tea Party recently at the top of Almscliffe Crag, where the Mad Hatter, White Rabbit and Queen of Hearts enjoyed a cuppa and admired the views! How you can help For more info, call 01423 501269 or visit yorkshirecancerresearch.org.uk where you can download a tea party pack. aster is a time for giving and what better way for people to send their greetings to loved ones than with a beautifully designed handmade card? Our eight pages of gorgeous free craft papers are the perfect starting place for your seasonal card making inspiration. This month we have have two Easter cards for you to try: a cute bunny as well as a pretty ﬂoral design which could be adapted for birthdays, thank yous and even get well soon occasions. Floral card Cut a piece of cross-hatch paper and white card each measuring 13cm x 18cm and glue them together. Cut three 5cm squares of ﬂowered paper and attach each to 6cm squares of white card. Add faux stitching using a ﬁne marker pen. Cut a heart shape and a sentiment from the tags sheet. Cut a piece of white card slightly larger all around for each of them. Glue the heart and sentiment to the corresponding white card, as shown. Stick a strip of green tape to the crosshatch paper, 2.5cm from the left and bottom edges, sticking the ends of the tape behind the card for a neat ﬁnish. Secure the sentiment in place using sticky pads and layer with the heart. Position the squares in place, securing the two ends ones ﬁrst with sticky pads and ﬁnally the middle one (placing in this order will help with spacing them evenly). Stick the completed image to the card blank using sticky pads, to ﬁnish. Hello Easter Bunny! Cute bunnies, chocolate eggs and soft pastels abound in this sweet design perfect for Easter buyers. By Wendy Massey Easter bunny card Cut two pieces of green ﬂowered paper: one 19cm x 13cm piece and one 13cm x 2.5cm strip and cut the same sizes from white card. Cut bunny and plant pot templates and eggs and sentiment from the tags page. Cut a slightly larger piece of white card for the sentiment. Stick ﬂowered papers onto the white card. Create a strip of grass from green tape and stick onto the 13cm x 2.5cm paper, turning under the tape to neaten. Fix to the 10cm x 13cm paper with sticky pads. Position the bunny and plant pot onto the card and attach using sticky pads in this order: ears ﬁrst, then head, then his plant pot and ﬁnally his paws. Stick eggs in place with sticky pads. Attach bow with a small sticky pad. Using sticky pads, secure the ﬁnished image onto the front of the card blank. Add a cute bunny face, sketchy outlines or faux stitching as desired, to ﬁnish. his little monster pencil case is not only fun for kids, but it’s an essential item for any school child. Made from soft ﬂeece and felt, it’s ﬂexible enough to ﬁt lots of pens and pencils into and so much nicer than a mass-produced neon PVC one! It has a cute monster face that won’t scare anyone away, and as the face is appliqué, you can develop your own designs from here to stay ﬂexible and ahead of the game. It’s fastened with a chunky zip which makes it very strong and practical for everyday use. Make in different colours to appeal to girls as well as boys. You could even swap the tie for a hair bow or buttons and we just know that kids will love the goggle eyes – they really make the little monster come to life! SAFETY FIRST This pencil case is not designed to be a toy but it will appeal to children so make it with care. Make sure the bead eyes are sewn on securely and the sections are all attached. Remember, if you intend to sell it, there are strict regulations to adhere to. Visit craftseller.com/free-downloads for advice on child safety. How to make the monster pencil case 1 Cut out the fabrics using the templates on page 102. Iron Bondaweb onto the appliqué pieces – blue body, eyes and tie. Peel away the paper and iron them into place onto the front of the monster. Stitch neatly around the shapes with a bright turquoise thread. 2 Take the front piece of the monster pencil case. Line up the middle of the zip with the centre top point of the monster. Pin and tack the zip along the top edge. Sew into place. Attach the other side of the zip to the back, pinning, tacking and sewing into place. 3 Unzip the zip and sew the rest of the pencil case together. Trim off the seams and turn the right way in. Make two tiny holes each side of your blue eye and slot the goggle eyes through. Push the backs ﬁrmly onto the inside of the pencil case to ﬁx the eyes securely. Zip up pencil case to ﬁnish. If you want a friendly, affordable & easy to use website to sell your creations then Crafters Boutique is for you! Rent your shop from as little as £6 per month - the longer you rent the more you save! Beautifully handcrafted and personalised bespoke gifts, children’s bedroom decorations/accessories, fun and easy sewing patterns and projects. Be inspired by these gorgeous giveaways, and enter today for your chance to walk away with a fab prize! CUTE CRITTERS Rebekah of TreeWingsStudio is behind Sleepy Critters – a gorgeous range of handshaped, painted beads. We’ve got ﬁve sets of four beads (worth £20 each) up for grabs, including owl, fox, fawn and rabbit designs. 7 3 prizes TO WIN! Day 2 I finally put needle to thread and started working on the owl sensory toy I made for Lottie last year. The feedback has been so good, I am pretty sure it’ll be a seller. This cute little wise guy will be part of a collection of nursery handmade goodies. I got round to drawing up the patterns for the three sizes of owl that I’ll be producing and spent most of today cutting out fabrics ready to sew up and make samples. I love this stage of the creation process because it’s such a buzz watching it all take shape. Can’t wait to get stuck in making lots of pretty owls out of all the gorgeous fabrics I’ve got lined up. Baking Harry’s birthday cupcakes is a family effort! Harry’s birthday, it got me thinking about new product ideas and how I could find time to launch a new monster collection this year. I’ve been thinking about it so much that their little monstrous but cute faces have been appearing in my dreams! I wonder if other crafters get similar visions when they’re working on an idea… I really do hope so! I narrowed it down now to a little family of three monsters to start with – a baby sensory toy monster aimed at newborns and youngsters, a midi monster which would be the perfect cuddle buddy for toddlers and then a maxi monster aimed at the older child. I’ve told Harry my plans and he’s very excited his birthday idea might become something more. Lord Sugar had better look out when Harry gets older! Day 13 Watching Lottie today as she pulled herself up on everything from the baby gate to the coffee table, babbling away to me and crawling about exploring every part of the house has confirmed that I’ve made the right decision. My working day is now limited to her nap times, which is just too short to get all I want done. I think it is the right time to stop supplying creations to trade and to stop doing custom orders, for the foreseeable future. Both are exceedingly time-consuming, and this way I can be more efficient with my day, get my new ideas off the ground and work on using up the room full of fabrics and haberdashery, which is now bursting at the seams. Lottie needs me, and one of the advantages of being a crafter and working for yourself is being able to prioritise the really important things in life. Day 17 Time to address the business of cakemaking for someone special’s birthday! We decided on one giant cupcake for his actual celebratory cake and ordinary-sized ones for the party bags. I thought a trial run might be fun before the actual event – besides you can NEVER have too many monster cakes in the house can you?! Baking with my family is always a rather messy affair and I’d love to blame the kids – but really the culprits are me and Martin. Martin loves preparing the cake mix – and I have to admit, I’m not sure what his secret is but his cakes always taste much better than my efforts. However, once they’re out of the oven and cooled I take the stage and am in charge of decorating, with the help of my trusty assistant Harry of course! I kept it simple and we are rather pleased with the way they look. And as for the way they taste, there aren’t many left by the end of the day, which speaks for itself! you can feel it in the air but you’re not quite sure what it is. Then there’s the distant rumble of thunder, but you wonder if you imagined it. Then crash – it’s happening: bright red cheeks, horrible nappies, chewing everything that’s not nailed down, dribbling, lots of tears and random deadof-night wakings. Lottie’s eight-and-a-half months so it’s exactly the right time for her first teeth to be cutting through. Harry was the same time. But it doesn’t make it any easier having been through it before. My time this month hasn’t been spent very productively if I’m honest. Thanks to being awake at 3am, instead of working in the evening, there’ve been a fair few early nights for me with a hot milky drink. Day 20 We are now a two-vehicle family – I’m so proud! Harry has a new scooter. On his days home with me and Lottie, I make sure the three of us have some fun. And for Harry that means scooting about on his new two-wheeler. It makes walks very time-consuming as he zips along, not in a straight line but in a very erratic zigzag. Lottie thinks it’s one of the funniest things she has ever seen and giggles constantly as she watches her big brother. ecoupage is well and truly back in fashion and creates a look that will attract potential buyers. Boxes can be found in junk shops and car boot sales so keep a look out. Here we’ve used printable sheets from a couple of Etsy shops (approved for use in small commercial craft projects), but original vintage books or ephemera could be used. Try a combination of full sheets and cut-out elements to add variety. The base and legs are painted a duck egg blue, but you could cover the whole box. How to make the sewing box Sand the legs, box and lid until most of the varnish has been removed. Put masking tape over the metal ends of the legs and apply two coats of paint to the legs, base and sides of the box, remembering to paint the inner edges too. Print any chosen decoupage sheets and decide which pieces to keep whole or use as cut-outs. Arrange the pieces on the lid, and once you’re happy, take a quick photo to record of the layout. Start in a corner and apply PVA to the area of the ﬁrst piece of paper. Don’t water down the PVA if you’re using printables it may cause the ink to run. Remember that you'll be building up the layers, so start with a piece that will be under the others. Smooth the paper down as you work – if you need to reposition, slowly peel back the paper to avoid tears. Smooth out any large bubbles as you work (the papers will bubble and wrinkle during glue application but once dry they will settle). items with a coat of PVA once stuck down, to stop them lifting. You may need to wait until the PVA is dry after laying a few pieces especially if they are overlapping others. Once dry, cover the decoupage with a very thin coat of PVA. Again the paper might bubble but should dry back ﬂat, however if the bubbles are large, gently press them back onto the lid with your ﬁngers. Wait a couple of hours for the PVA to dry before applying a second coat. Once the PVA is totally dry apply a very thin coat of clear varnish (try a test patch at the back of the lid if you wish). The decoupage may bubble but should dry back. Apply another few coats of varnish, making sure each one is dry before applying the next. Varnish or wax any painted areas. INFORMATION Materials * 2 x 100g DROPS Lace in cream (shade 0100) * 3mm (UK 11, US 2/3) needles – just for the tension square * 4.5mm (UK 7, US 7) needles * 3.25mm (UK 10, US 3) circular needles * Tapestry needle for sewing * One button Size: To ﬁt size 10/12 Sleeve measurement: 58.5cm (23in) from wrist to underarm Skill level: Moderate Tension: Using 3mm (UK 11, US 2/3) needles, cast on 28sts and stocking stitch 34 rows to give a 10cm (4in) square. Note: This shrug is knitted in one piece. It is knitted using two strands of yarn together. n spring and early summer, things can get a bit nippy, but everyone wants to shed the layers and dig out those lovely summery outﬁts. Fill the chill gap with this beautiful warm and light lacy shrug. It has that quirky vintage style that everyone wants, but remains a truly practical and worthy buy for those who’re savvy with their pennies. Knitted in ﬁne lace yarn, you’ll work two strands together so it knits up quicker and has a more substantial feel. The DROPS Lace yarn is wonderfully soft and silky made from 70% alpaca and 30% silk and being a natural yarn, it is kind to delicate skin but warm enough to keep off the chill. The stunning ﬂoral attachment is made up from three layers of knitted petals that are then sewn together and ﬁnished off with a button to the centre to give it a sweet vintage style. Start at right sleeve Using 4.5mm (UK 7, US 7) needles, cast on 38sts not too tightly. Row 1: K3, *yfwd, k2tog, k3 rep from * to end. Row 2: Purl. Rep last 2 rows 7 times more. Next row: Inc in ﬁrst st, patt to last 2sts, inc in next st, k1. 40sts. Next row: Purl. Rep rows 1 and 2 four times more, working the additional sts as st-st. Next row: Inc in ﬁrst st, patt to last 2sts, inc in next st, k1. 42sts. Next row: Purl. Next row: K5, *yfwd, k2tog, k3 rep from * to last 2sts, k2. Next row: Purl. Rep last 2 rows 2 more times. Next row: Inc in ﬁrst st, patt to last 2sts, inc in next st, k1. 44sts. Next row: Purl. Next row: K1, *yfwd, k2tog, k3 rep from * to last 3sts, yfwd, k2tog, k1. Next row: Purl. Rep last 2 rows 2 more times. Inc one st as before at each end of next, and every foll 6th row till 84sts, working extra sts in patt. Add a st marker at both ends. Work 5 rows in pattern. Next row: Patt to last 2 sts, inc in next st, k1. 85sts. Work 5 rows in pattern. Rep last 6 rows till 89sts. Cont in patt without shaping for a further 51 rows. Dec one st at end of next and every foll 6th row till 84sts then at both ends of foll 6th rows till 42sts. Cont to dec one st at each end of 8th row then foll 10th row. 38sts. Patt 15 rows without further shaping. Cast off loosely. turn. 8sts on left hand needle. Next row: Purl 8, turn. Next row: Knit 8, turn. Next row: Purl 8, turn. Next row: K2tog tbl, k4, k2tog, turn. 6sts. Next row: Purl 6, turn. Next row: K2tog tbl, k2, k2tog, turn. 4sts. Cast off 4sts. Cut yarn and rejoin to rem sts. Work pattern as before on next 6sts and so on till 6 petals have been worked. Next row: Inc in ﬁrst st, k4, inc in next st, turn. 8sts on left hand needle. Next row: Purl 8, turn. Next row: Knit 8, turn. Next row: Purl 8, turn. Next row: K2tog tbl, k4, k2tog, turn. 6sts Next row: Purl 6, turn. Next row: K2tog tbl, k2, k2tog, turn. 4sts. Cast off 4sts. Cut yarn and rejoin to rem sts. Work pattern as before on next 6sts and so on till 6 petals have been worked. Layer 2 (make 2 pieces): Using 4.5mm (UK 7, US 7) needles, cast on 12sts. First row: (Inc twice in each st by knitting into the front then the back then the front) to end. 36sts. Next row: Purl. Dampen shrug and pin to a blocking board with right side facing, stretching where necessary to ensure the holes lie in straight lines. Allow to dry. Remove from board and sew sleeves for 58.5cm (23in). Turn right side out. Border Use a 3.25mm (UK 10, US 3) circular needle and 2 strands of yarn. With right side facing and beginning at bottom of armhole, pick up 125sts along right armhole, neck and left armhole and then 131sts along back of shrug. 256sts. Work 5 rows 1x1 rib. Cast off (not too tightly). Sew each end of border together. Sew in all loose ends. Layer 3 (make 2 pieces): Using 4.5mm (UK 7, US) needles, cast on 12sts. First row: Purl. Next row: (Inc twice in each st by knitting into the front then the back then the front) to end. 36sts. Next row: Purl. Next row: K6, turn. 6sts on left hand needle. Next row: Purl 6, turn. Next row: K2tog tbl, k2, k2tog, turn. 4sts. Cast off 4sts. Cut yarn and rejoin to rem sts. Work pattern as before on next 6sts and so on till 6 petals have been worked. With right side facing, join each pair of ﬂower petals then sew ends together to create circle. Leave layer 1 and 3 with central hole but for layer 2, sew a length of yarn around each st in circle then pull up tightly to close. Trim all loose ends. Pin onto a blocking board, dampen and allow to dry. Remove from board and place layers on top of each other starting with the largest, ensuring each layer sits on top of the ﬁrst one with the petals covering the spaces left between the petals of the previous layer. Sew together securely then add a button to the centre. Pin in place on shrug then sew in position, sewing some of the top petals to the shrug as well as the centre of the ﬂower to help the ﬂower keep ﬂat and not fall forward. Tie in all loose ends to ﬁnish. Appeal to the wedding buyer by knitting in popular bridal hues (white, ivory, cream, champagne, taupe, rose) and listing under 'wedding' and 'bridal', etc. Photograph your model in head-totoe vintage glamour to attract this blossoming buyer demographic. Monitor colour trends and whip up a couple of shrugs in those hues then market as a 'must-have' item. Be size wise: Make a couple of shrugs XS and XL to cover all shapes and keep your customers happy. Shout about the quality – if using British Wool, pure Alpaca or eco yarn, let customers know all about it! Model your own handiwork! Wear it yourself and tell people you made it – you may get lots of new commissions! Think about your tags: List under and tag with 'gifts for her/mums' as well as 'Brit-knit', 'vintage style' and '1940s glamour' to broaden your market. Seek out craft-loving bloggers and send pics of your gorgeous shrug to them. They're often looking for new content and may well give you a mention. Team with other knitted makes such as purses or bags so buyers can see (and buy!) the other items in your fabulous range. Target yummy mummies by making shrugs for tots to teens in bright colours with detatchable button-on ﬂowers for the older ones. ith Etsy, Folksy and a host of other handmade marketplaces on the internet, is it really worth the time and effort involved in setting up a craft fair stand? “Yes!” resounds Beckie Melvin, who has been a crafter for ten years, moving from card making and papercrafts onto textiles and fabric projects (check out her work at facebook.com/KittyKatCrafts). “Craft fairs are a great way to meet fellow crafters, network with locals, promote your brand and, of course, make some sales.” In fact, Beckie believes in the power of the personal approach, so much that she set up her own events business two years ago, organising craft fairs and events all across the UK (CraftFairsUK.co.uk). “Attend small fairs to trial stock and gauge volumes needed for larger events” advises Madelon. “You don’t want to sell yourself short, but you don’t want to take that piece back home with you after the show’s over. Ask yourself if it’s worth it to have that piece sitting in your studio/ storage until next time. Think about why that piece didn’t sell. Was it the price? Did it take you too much time to make? Is there an easier way to make it so you can reduce the price? Is it worth ever making it again if you can’t?” Look at what other sellers are charging for similar items, and think about running special promotions to attract shoppers. After all, everyone loves a bargain! Tips for craft fair beginners 1. DON’T SET OFF TOO LATE Packing and unpacking the car and setting up your stand can take longer than you think. 2. DON’T FORGET TO DO YOUR RESEARCH – the wrong type of fair can be a waste of time and money and may even do damage to your brand! 3. DON’T PRESUME A HIGH FOOTFALL MEANS INCREASED PROFIT. Larger fairs cost more and more stalls mean a wider choice for shoppers – so you have to work harder to make any money. 4. DON’T LEAVE HOME WITHOUT YOUR BUSINESS CARDS – sales after the event are just as important as those made on the day, so make sure all your contact details are on there and that your card is well-designed! 5. DON’T BE TOO SERIOUS – have fun, smile, and you’ll draw in the crowds. P R O F I TA! How to make the felted bugs 2 To attach the head to the body, ﬁrst place it on top of the body and then stab the bottom of the head into the top of the body until it stays ﬁxed. Cover the head and body with another layer of the wool roving. Wrap it around the neck to cover the join. Stab the wool roving in place with the size 38 needle until it is ﬁxed and smooth. Build up the layers until you have the required shape. his cheerful trio of butterﬂy, bee and ladybird are classic bugs full of cheeky character which are so much fun to make. Made using a mixture of materials and techniques, they really allow you to showcase your skills, so make sure you emphasise their handmade qualities to customers. The main basic shape is needle felted; the wings are felt with needle-felted details; and the faces have felt, bead and embroidery embellishments. They make the perfect gift for spring time, in fact your customers are sure to keep bugging you to make more! 3 To help the body stand upright, stab the bottom and push it with your thumbs to make it ﬂat. Do the same for each insect but change the wool colour. Remember to use brown wool roving for the bee’s head, and yellow wool roving for the body. wings. * Red felt: cut four ladybird wings. In baby pink felt, cut six cheeks. 1 Before using the wool roving, ﬂuff it up slightly ﬁrst. To make the body, roll up 10g of the wool roving into a ball and stab with the size 40 needle until it becomes solid. To make the head, roll up 7g of the wool roving into a ball and stab with the size 40 needle until it becomes solid. 4 To make the stripes on the bee, take two long strips of brown wool roving that are about 1cm (¼in) wide and wrap each one around the bee’s body. Stab these in place with the size 38 needle. 5 To make the dots on the butterﬂy, roll up small pieces of orange wool roving into oval shapes that are different sizes and stab each one in place on the body with the size 38 needle. 6 Roll a 10cm (4in) length of cream wool roving that is 3cm (1¼in) wide into an oval shape. Place it on the insect’s head to make the face and stab it with the size 38 needle until it stays ﬁxed and is smooth. 7 Sew the two felt cheek shapes onto the face using an overstitch. Then sew on the two felt eye shapes. Sew a black bead onto each felt eye. Then using one strand of the black embroidery thread, double it up and sew a simple smile between the cheeks. Do the same for each insect. Sew each pair of felt bee wing shapes together using an overstitch and then sew them onto the back of the bee’s body. 8 To make the dots for each ladybird wing, roll up small pieces of black wool roving into circle shapes and stab them in position on each wing with the size 38 needle until they stay ﬁxed. Make sure the dots look symmetrical when the wings are placed next to each other. Sew the dotty ladybird wings onto the plain felt wing shapes using an overstitch. Sew the top of wings onto each side of the ladybird’s body. 10 To make each antenna, ﬁrst roll up a 5cm (2in) length of 2cm (¾in) wide wool roving into a small ball and stab with the size 38 needle until it becomes solid. Then fold a 10cm (4in) length of 3cm (1¼in) wide wool roving in half so it is about 1.5cm (½in) wide. Roll it up into a cylinder shape and stab it with the needle to make it solid but keep each end ﬂuffy. Stab one end to make it thinner and pointier than the other end. Hold the shape in a bent position and stab it with the needle to keep it bent. Stab the pointy end into the ball until it is ﬁxed and stab the other end into the insect’s head until it stays attached. Do this twice for each insect. 9 On each felt butterﬂy wing shape, stab three different-sized oval shapes of orange wool roving in place using a size 38 needle. Stab a circle of orange wool roving onto the bottom of each wing shape and stab two tiny dots of blue wool roving on top. Sew each pair of butterﬂy wings together with an overstitch, then sew the wings onto the butterﬂy’s back. SAFETY FIRST The needles snap very easily so only use to stab rather than to reposition the wool. It may be a good idea to buy a few needles so you have spares. It is also very easy to stab your ﬁngers with the needles so it may be a good idea to wear a thimble. Remember, if you intend to sell it, even if it is not sold as a toy, there are strict regulations to adhere to. Visit craft-seller.com/free-downloads for advice on child safety. Make cute accessories such as a blade of needle-felted grass, several sweet blooms or a tiny honey pot to accompany each bug. Create add-ons such as little baby ladybirds, a queen bee complete with crown or a leaf-munching caterpillar! Photograph your bugs amongst the roses or hiding in the strawberry patch to add a sense of fun. Make cake toppers and ﬁx onto cocktail sticks or sell as sweet table decorations for a spring wedding. Watch your ﬁnish! Make sure your felting is tidy and all stitches stand up to scruitiny by eagle-eyed buyers! Offer free gifts for multiple sales. A packet of ﬂower seeds would be a sweet touch that costs pennies! Use photo-real colour schemes. Butterﬂy fans love accurate versions of favourites like the Red Admiral, Painted Lady or Tortiseshell so stay real! Have fun with packaging. Why not make a hive for the bee and leaf or ﬂower-printed boxes for the ladybird and butterﬂy? Use as cute props when displaying or photographing other spring makes but make sure you list the bugs' prices as you might pick up some extra sales. Needle-felt a whole tiny world which buyers can collect such as dragonﬂies, ﬂowers, toadstools... the possibilites are endless! Totes amazing! I’ve said I’ll make some craft items for a fair my best friend has organised. But I have no idea where to start and time is running out… On top of this, my skill set is limited and I have no sewing machine, to whip up a few makes in an evening! TRISTAN, LONDON We have a totes simple idea, which will make you look like a craft-selling expert. Yes that’s right, tote bags. You don’t even have to sew the bags. You can purchase 100% recycled calico cotton bags for just £1 (hobbycraft.co.uk) and then cut out stencil shapes on acetate and secure on the bag with double-sided tape. Place thick cardboard inside the bag. Lightly ﬁll in the stencil using fabric dye, building up the layers and allow to dry completely before removing the stencils. Hand stitch any embellishments as required for that ﬁnishing touch! Tote bags like these from Hobby Craft are easy to embellish and look fab! Charity case I make cakes and bakes for our village charity fêtes twice a year but have recently been told that I now need a hygiene certiﬁcate and must abide by the European food safety laws. When I tried to look it up, my head started spinning! I am so, confused – please help! MRS JEAN ROSSNER, GLOUCESTER You are not alone in being confused about the exact rulings but we have some good news for you! Last year, the Food Standards Agency ruled that volunteer cooks and charity groups who occasionally prepare food for community events are not covered by EU laws. This also means you no longer need to possess a food hygiene certiﬁcate before you’re allowed to offer your wares for sale. So in simple black and white terms: “There is no rule banning the sale of homemade cakes at school fêtes or other community events.” The exception to this would be organisations that regularly serve hot food, cater for children under the age of ﬁve or elderly people, or sell food at large-scale events – then they must be registered. 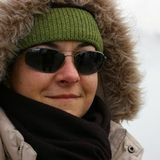 LIS WILLIAMS (NoodleBubble on folksy.com) on how NOT to run a craft stall! Turn up on the day and expect to be given your ideal stand. Learn how to put up your borrowed gazebo on the day. Don’t bother with a table cover. Never use labels… change your prices based on how rich people look. Business cards are an avoidable, unnecessary expense. Don’t waste any time! Call friends or watch YouTube vids. If a buyer doesn’t have a bag, point out that they should to help the environment. Let shoppers ﬁnd the right money… why should you lug around change? Look bored and check your watch. Rely on other sellers for change and bags. Getting crochety I remember my Irish granny doing Irish crochet and I have found some vintage patterns but cannot make head nor tail of them. Where’s the best place to start? We love the musical note ribbon from the cakecraftshop.co.uk, for 82p/m. There’s a good selection of vintage sheet music from eBay on a buy-itnow basis. Check ebay. co.uk/usr/gerrysalgado who sells sheet music from old books, in various conditions. EMMA, NEWCASTLE Irish crochet has always been an important part of the Irish needlework tradition. When times were hard, women had to ﬁnd ways of supporting their family, and crocheting was popular as the equipment needed was simple – just a crochet hook and cotton. As you’ve already discovered, vintage patterns can be bewildering and diﬃcult to interpret. Kathryn White has done the hard work for you and written The Go-To-Book for Irish Crochet Motifs (£9.99, searchpress.com), which includes easy-to-follow instructions and chapters on stitches, techniques, edging and assembly. Tax payer In my spare time I like to buy old handbags, upcycle them and sell them on eBay. I would call it a hobby but do I have to let the tax oﬃce know? return. If the level of sales don’t exceed the VAT threshold, which is currently £79,000, Amy-Lee does not need to register for VAT.” If you would like to ﬁnd out more about your tax responsibilities visit hmrc.gov.uk for more information. Victorian values I am looking for Victorian-style etchings to use for my new card range. Where can I source good quality images that I can use without having to worry about complicated copyright agreements? #:kZc^[>Y^Yc¼ihZaahdbZi]^c\i]Zn are a great way of building your email lists. =dlbjX]gZeZViWjh^cZhh^hadhiVindjghVaZh XdjciZg46h`[dgWjnZgh¼ email details, sweeten the deal by offering an incentive such as a discount e-voucher. >chiZVYd[bdcZnd[[ndj could offer subscribers exclusive promotions, such as the ﬁrst chance to buy your new product. A Crash Course in Email Marketing for Small and Medium-sized Businesses Wn?d]cL=VnZh]Vgg^bVc"]djhZ#Xdb!.#..
ith Mother’s Day fast approaching you’ll need some products in your range that’ll attract dutiful present-buying offspring! These delightful lavender bag hearts are reminiscent of the old days, when they were used to freshen laundry, keep wardrobes and drawers smelling gorgeous, and keep unwanted winged guests at bay. These days they make beautiful adornments hung on doorknobs or hooks around the house, ﬁlling the air with the delicate fragrance of lavender. Using scraps of shabby chic cotton fabrics in beautiful spring colours, they’re bound to put a smile on the face of the best mum ever. Using the templates on p102 cut two large heart shapes and one long loop shape. Cut one each of the smaller heart shapes – we’ve used pinking shears but a plain edge would look just as good. Use the letters to spell out and print words of your choice on the smallest heart shape. (¼in) seam allowance around the edge of both hearts using pink thread, or a colour of your choice that stands out. Fold the long loop piece of fabric in half length ways right sides together, pin, sew a running stitch length ways with a 0.5cm (¼in) seam allowance all the way to the end. Turn right side out and with the seam centre back, press ﬂat. Make a loop shape and pin ends together. Take the two large heart shapes, place ﬁrst piece with right side facing up, pin loop piece to centre top of heart with loop facing down, and raw ends poking out the top of heart, place second heart piece right side facing down on top and pin both pieces together around edge. Sew a running stitch around the edge of heart, with a 0.5cm (¼in) seam allowance. Leave a 5cm (2in) gap for turning and stufﬁng. Turn right side out and press. Using a piece of paper folded into the shape of a cone, create a funnel and slot it into the small gap that you have left. Fill the heart with dry lavender. Neatly handsew the opening closed. 1 How to make the rug Cut a 184 x 104cm (72½ x 41in) rectangle from both patterned oilcloths. Sew together (wrong sides out) leaving one short side open. Cut corners off to prevent bunching and turn rectangle inside out. 2 Fold in the edges of the short end that was left open and sew closed with a top stitch. Continue top stitching along the edges of the rug to make it look neat. 1 How to make the cushion Fold one long edge of both the cushion back shapes to make a 2cm (¾in) hem. Topstitch in place and pin onto the cushion front (right sides together.) Hems should be central and overlapping. Sew these in place. 2 Trim the corners and turn the cushion cover to the right side. Place the cushion pad inside and make sure it ﬁlls all the corners. 1 How to make the bag Sew each bag side shape to each short side of the bag front shape with right sides together. Sew the longest side of the bag base shape onto the bottom side of the bag front shape (right sides together). Sew short ends of side shapes and base shape together. 2 Sew the bag back shape onto the other side of the side shapes with right sides together to complete the main bag shape. Turn the bag to the right side and fold the top edge inside the bag by about 3cm (1¼in). Pin in place. ow that brighter days are here, this picnic set is the perfect project to get shoppers in the mood. Ontrend with its pretty prints, it’s practical and hardwearing. Chill out on the rug if the grass is a bit damp or use as a tablecloth for laying out the lunch. There’s a matching cushion for a touch of comfort and a large, roomy tote bag that’ll pack a picnic, no problem. As it’s all made from oilcloth, which can be pricey, don’t be afraid to charge a premium – your customers will appreciate the quality. Cutting out the templates All the templates include a seam allowance of 1cm (¼in). Follow the instructions on the individual templates and make up the following. * In the polka dot oilcloth, cut two complete ‘cushion backs’ and four complete ‘bag straps’. * In the ﬂoral oilcloth, cut two complete ‘bag fronts’ and ‘backs’, two complete ‘bag sides,’ one complete ‘bag base’ and one complete ‘cushion front’. Note: Use a standard sewing machine foot when sewing the cotton side of the oilcloth and the roller sewing machine foot when sewing on the shiny side of the oilcloth. 3 Sew each pair of bag strap shapes together along one of the long sides (right sides together). Turn straps to the right side and pin this long side down. Fold remaining long sides in by 1cm (¼in) and pin in place. Use top stitch along each long side of straps. 4 Pin each end of the straps onto the top of the bag 12cm (4¾in) from each edge of the bag, so ends meet the end of the 3cm (1¼in) hem on the inside of the bag. Sew three lines of topstitching along the top edge of the bag to secure and sew the hem down. Learn To Make Jewellery “Three ladies travelled all the way from Fort William to attend my first block of classes in Inverness – now they work together to produce pieces, hold sales and have their own website!” Helen Cormack, founder of the Learn to Make Jewellery workshops, is rightly proud of the impact of her classes. At her full-day workshops in Inverness and evening classes in Elgin, Helen teaches traditional jewellery-making techniques using precious metals. Learners are taught to use a jeweller’s saw, plus the arts of soldering, doming and forming, etching, clay casting, polishing and finishing, riveting and basic stone setting and more. THE CRAFT ROOM Products for cardmaking, scrapbooking, papercrafts and beading. Stockists of a wide range of scrapbooking papers, quilling papers and decoupage sheets. IS ON SALE FROM 10 APRIL SUBSCRIBE TODAY TO CRAFTSELLER Order online at buysubscriptions.com/craftseller Call now on 0844 322 1236 Lines open weekdays 8am to 8pm and Saturday 9am to 1pm. Now post your order to: FREEPOST RRJZ-HJKA-ZBCX, Craftseller, PO Box 326, Sittingbourne, Kent, ME9 8FA Please allow up to 28 days for delivery. All prices inclusive of P&P. Data protection: Immediate Media Company Bristol Ltd (Publishers of Craftseller) would love to keep you informed by post or telephone of special offers and promotions from the Immediate Media Company Group. Please tick if you’d prefer not to receive these ❑ * Please enter this information so that Craftseller may keep you informed of newsletters, special offers and other promotions by email or text message. You may unsubscribe from these at any time. * We can’t resist sharing a tasty morsel that’s vegan-friendly too! * We’re not worried about hayfever season with this funky tissue box by our side. * Laser-cut design in on-trend shade of blue? Yes please. Pop a pair in the post today! Go aheadâ&#x20AC;Ś get creative! JP760 A Âž size machine that is light enough to carry to classes, yet packed with 60 stitches and full of computerised features to make sewing easy. DXL603 :LWKEXLOWLQVWLWFKHVIRUTXLOWLQJ and heirloom as well as general sewing this is an excellent all round machine. Stitch selection and settings are so easy on the large information LCD screen. Janome has a great range of machines to offer the very best in computerised sewing. QXL605 All the features of the DXL603 EXWZLWKDQDXWRPDWLFEXLOWLQWKUHDG cutter and advanced feeding system for precise stitching. TXL607 2XUĂ&#x20AC;UVWPRGHOZLWKDOSKDEHW & memory facilities. It has direct stitch selection for the most useful stitches and a handy panel for quick selection. Sewing difďŹ cult fabrics can get really tricky even for the more experienced. Janome machines are reliable and robust and tackle difďŹ cult fabrics with ease. The Memory Craft 5900QC has an incredible range of stitch optionsâ&#x20AC;Ś whilst the portable Jem Platinum, DXL603 / QXL605 and TXL607 models are high speciďŹ cation machines at affordable prices.